We're really in the swing of winter term now! Find out what happened this week at Pono. Pono friend and resident bird expert, Bodi, taught us about birds of prey. We learned there are raptors that live right here in New York City and what special features they use to catch their food. We are always learning from our young Pono friends! Musician Alex Kramer returned to Pono with his banjo and led the children in some lively rounds of square dancing. Dr. A and the older children examined the microbial colonies in their petri dishes and described the different types of bacteria growing there. They also began discussing alternative energy sources, and the children chose topics such as solar energy and biofuel that they would like to explore in greater depth. This week the younger children and Dr. A also checked their petri dishes and were excited to find a lot of microbial activity! Jasper brought in a yummy gluten-free chocolate peanut butter coconut pie with a very fancy birthday candle to share with his Pono friends! The younger children, Ali, and Salma made dolls using craft sticks, tissue and construction papers, and of course, googly eyes! Math instructor David D'Alessio and the older children reviewed multiplication. 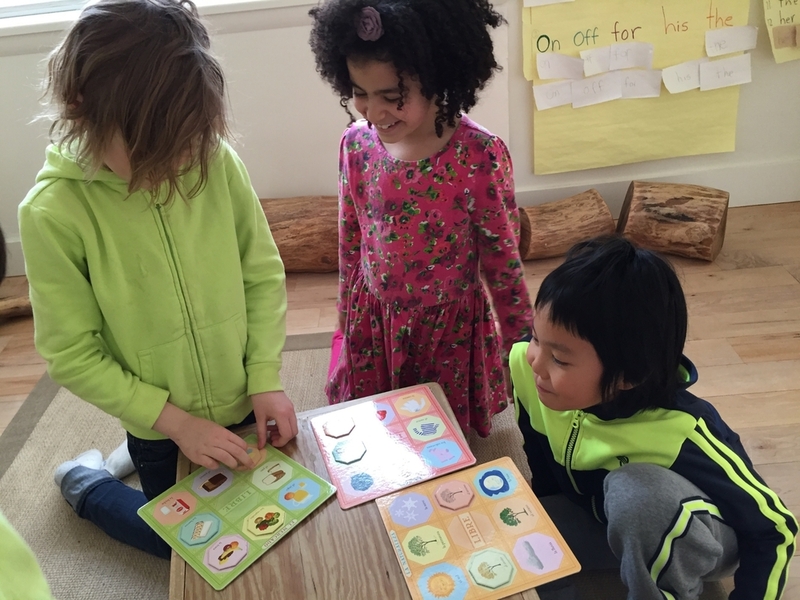 The littlest Pono friends explored sequencing numbers with David. Kate and the older Pono amigos and amigas played Spanish bingo. The children listened carefully for new vocabulary terms about transportation, weather, food, clothing, and animals and delighted in finding a match on their cards. Later in the week the older children played several rounds of Christine Berrie's beautifully illustrated "Bird Bingo." They're now ready to identify any pied wagtails, saddle-billed storks, or laughing kookaburras that fly their way! This week's field trip was especially delicious! We celebrated Pono friend Jasper's birthday with a trip to L'Arte Del Gelato in Long Island City's Falchi Building. Gelato maker Luciano Boron and general manager Marco Cattaneo gave us a tour of the production facility, explained the different pieces of equipment, and told us how their traditional Italian gelato is different from ice cream (it's denser). Then it was time to get to work! Garbed in hairnets and chef coats, the children sliced strawberries. 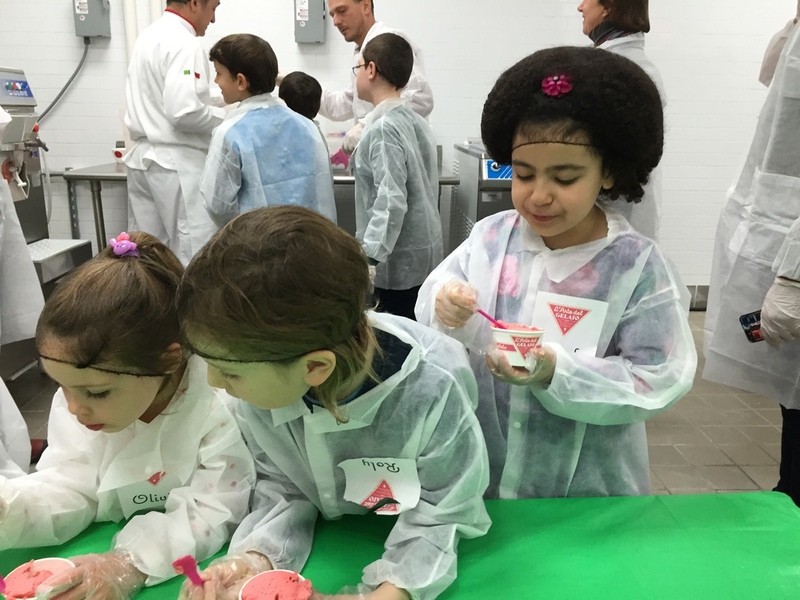 Then Luciano and Marco added a few more all-natural ingredients (no artificial colors or additives), and within minutes we were enjoying fresh strawberry sorbet! Next, our hosts brought out the ingredients for chocolate gelato and we watched with anticipation as the creamy treat emerged from the machine. Delizioso! Thank you to our gracious and generous hosts!